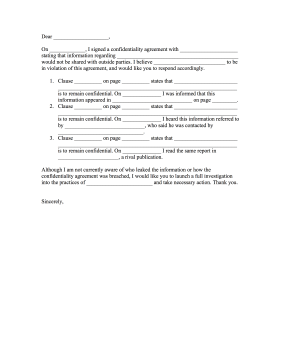 Fill in the blanks in this contract complaint letter when there has been a breach of confidentiality. On _____________, I signed a confidentiality agreement with _____________________ stating that information regarding ____________________________________________ would not be shared with outside parties. I believe __________________________ to be in violation of this agreement, and would like you to respond accordingly. 1. Clause __________ on page __________ states that _______________________ _________________________________________________________________ is to remain confidential. On ______________ I was informed that this information appeared in _____________________________ on page _________. 2. Clause __________ on page __________ states that _______________________ _________________________________________________________________ is to remain confidential. On ______________ I heard this information referred to by _____________________________, who said he was contacted by _______________________________. 3. Clause __________ on page __________ states that _______________________ _________________________________________________________________ is to remain confidential. On ______________ I read the same report in ______________________, a rival publication. Although I am not currently aware of who leaked the information or how the confidentiality agreement was breached, I would like you to launch a full investigation into the practices of ________________________ and take necessary action. Thank you.